Following on from concerns about Re-Design and the decimation of CWU's Health and Safety Dept, which is denied by those directly involved with the Re-Design strategy, many USRs are concerned by the emerging changes to the way in which Health and Safety is being interfaced with Branches, and the apparent diminution of Health and Safety in preference to Industrial Relations. 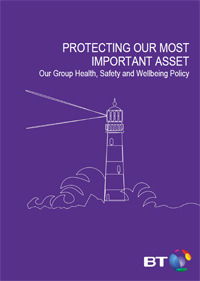 Many ASR/USRs also believe that it is now becoming clear that the intent of Re-Design is to transfer most Health & Safety issues to the remit of IR reps and officers nationally and locally, starving the Health & Safety Dept of work and responsibility and therefore paving the way for it's eventual destruction or merging into the legal dept. The use this month of Motion 77 carried at this year's CWU T&FS Conference, to remove Health and Wellbeing from the remit of the Unions Safety Reps and Health & Safety Dept, has outraged and insulted both Area Safety Reps in the Postal Constituency and USRs in the T&FS constituency; as has the claims that appear to being briefed out to Branches that USRs don't deal with Health and Wellbeing issues or those of mental health! What is even more shocking is that it has been suggested by a number of sources, that the decision to do this was taken at a meeting at which not one single Union Safety Rep or Branch Health & Safety Officer was present and had the backing of All Branch IR officers at the meeting. Whilst it may be that most Branch Secretaries deal with the aftermath of mental health problems that affect our members once they get to the sick leave and disciplinary stage, many USRs and Health and Safety Officers in Branch's also deal with members who suffer from mental health problems at an early stage and make appropriate representations to management, and also deal with personal cases themselves. However, that has nothing to do with the overall issue of Health and Well being which is a core Union Safety Rep issue across all Trade Unions and certainly within the TUC as their policy on the subject is formulated by Health & Safety Dept. The CWU H&S Dept and ASR/USRs have traditionally dealt with Health and Wellbeing and interfaced with both BT and the RM Group management in forming campaign days, and policies. At Branch level ASR/USRs are heavily involved if not the lead on Health and Wellbeing events. But most of all, the terms of Motion 77 do NOT mention Health and Wellbeing as an issue. It deals with the need for mental health training for Openreach managers in order to deal with those suffering PTSD. As can be seen above, the terms of the motion are unambiguous and clearly have nothing to do with Health and Wellbeing as an issue or which CWU HQ Dept has jurisdiction. In short it gives no justification for the removal of Health and Wellbeing from Heath and Safety to that of Industrial Relations! The CWU Health and Safety Community can be forgiven for seeing the decision by the T&FS to remove Health and Wellbeing from the Health and Safety Department and USRs as being political and in line with the aim of Re-Design to get rid of a stand alone Health & Safety Dept . This is the view of some commentators and ASR/USRs across the country. Further still, when you look at the debate over re-design and LTBs which refer to it, health and safety is NEVER mentioned unlike Education, and Equality. It has also been noticed that LTB's which have always been issued by the head of the Health and safety department, seem now to being issued outside of the department giving the impression that an attempt is being made to minimise the issuing of H&S LTBs from the dept. But more dramatically negative for our members is the fact that agreements with employers on ostensibly health and safety issues appear on first sight, to be made by members of the occupational executive with no knowledge or training on health & safety! 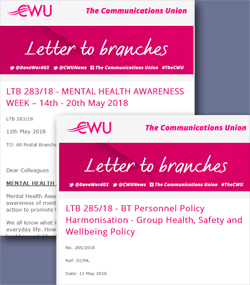 LTB283/18 concerning RM Group and Mental Health Awareness Week last month was issued by the Postal Technical and Central Services Department, rather than the Health and Safety Department. Not only is the LTB minimal in it's content, and empty of any real information pertinent to the issue, it also claims the department is working with Royal Mail Group on mental health strategies, despite the fact that this issue has traditionally been under the auspices of the Unions ASR/USRs and the Health and Safety Dept. This website has covered the issue over the years and Mental Health is undoubtedly a Health and Safety issue and one that the Department has promoted constantly with LTBs full of advice and references to helpful documentation and websites. This is NOT an Industrial Relations issue and yet the issuing of this LTB once again seems to indicate that the H&S Dept is being side stepped. The LTB from the Postal Technical and Central Services Department was a duplication of what the H&S Dept traditionally issues, albeit several days earlier and with minimal information. Question is why the need? Doesn't one department talk to another? Again, is the taking of issues from the health & safety dept, the point of the exercise, as is the move of Health and Wellbeing to Industrial Relations? Of even further concern is LTB285/18 which refers to BT Group Health, Safety and Wellbeing Policy and has no reference whatsoever to the Union's Health and Safety Dept suggesting their non-involvement! Given that it is the first policy document on health and safety that includes a statement regarding disciplinary action, it is astonishing to believe that anyone with any Health, Safety and Wellbeing knowledge would have agreed such a document! In essence it undermines all of the hard work done over the years by USR's, Branch Health and Safety Officers and Regional H&S Committees with BT on ensuring disciplinary action has absolutely nothing to do with health and safety policies and procedures. Some will see this as a good example of why health and safety issues cannot be left to IR reps. Both have important work to do in protecting and promoting the interest of CWU members and both require a level of expertise specifically to the individual role. Furthermore, USRs have legal rights which even Branch Secretaries don't have and can use legislation that again is not pertinent to IR roles. 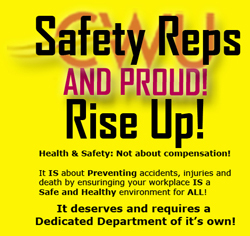 Health and Safety legislation is not understood by many or indeed those outside of the CWU H&S Community are often totally unaware of it and when IR Reps and National Officer's deal with issues which are also pertinent to H&S ; they fail to utilise the appropriate legislation or seek H&S Dept support. At Branch level, ASR/ASRs are often brought in or sought out for advice on situations which require H&S knowledge; or asked to deal with an IR/H&S problem; and especially involves a personal case. As we all know, a bland statement with no detail whatsoever does not make Health and Safety policy. it brings back the spectre of blame being associated with accidents and personal behaviours being subjected to disciplinary action rather than taking the appropriate management action to minimise and manage risk. Already managers are trying to maintain an element of blame attached to those involved in health and safety incidents. Finally, the question has to be asked - what right do Industrial Reps have to attack Union Safety Reps of the CWU in this manner, and remove areas of their responsibility at Branch level and at national level too? Editor's Note: The authors of the LTBs referred to in this article were asked to comment, but to date have not responded.